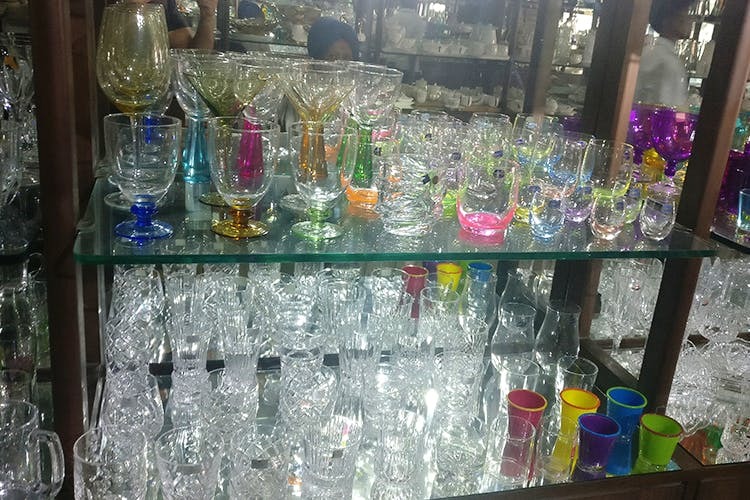 Little Woods is a crockery shop in Karol Bagh where you'll find colourful bar glasses, goblets, accessories and more. We stumbled upon this shop on a stroll through the Karol Bagh market. You won't find the most elegant or top-of-the-line stuff here, but if fun, colourful bar glasses are part of your next house party plan, you've struck gold. A whole section of the shop is dedicated to bar accessories—specifically glasses. The line-up of colourful shot glasses are bound to catch your attention right off the bat–they've got a couple of different sizes in these and will cost you INR 1,350 for a set of six (INR 1,500 for the bigger ones). They've got wine glasses too, but we liked the right-out-of-GOT goblets way more. The small ones are INR 2,750 for six. They've also got martini and champagne glasses that'll spruce up your bar—these are priced at INR 1,250 for six, and INR 3,000 for six respectively. Grab a pair of beer mugs for INR 400 and coloured - yes, coloured–whiskey glasses at INR 2,200 for a set of six. There's not much else you'll want to get your hands on here. We found the kitchen crockery, showpieces, and other stuff to be a bit tacky. Don't forget to haggle for the price to bring it down by a significant margin–you're in Karol Bagh, after all. Oh, and finding a parking spot will be difficult—but not impossible—so take your chances.